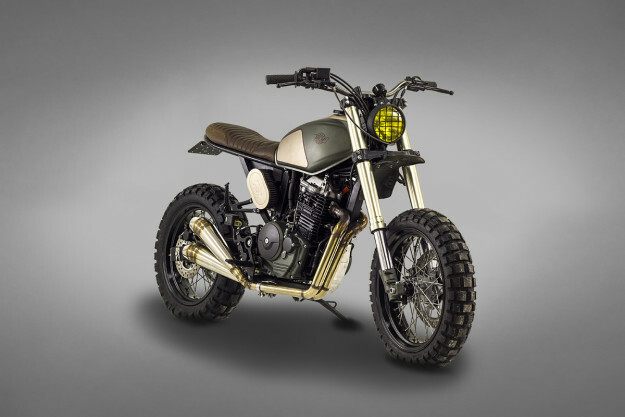 If current trends are anything to go by, Honda thumpers might soon surpass the mighty CB-series as the platform of choice for custom builders. And why not? They’re torquey, nimble and unbreakable—and in the right hands can both look good and be practical. Which is exactly why Portugal’s Ton-Up Garage picked one for their latest project. 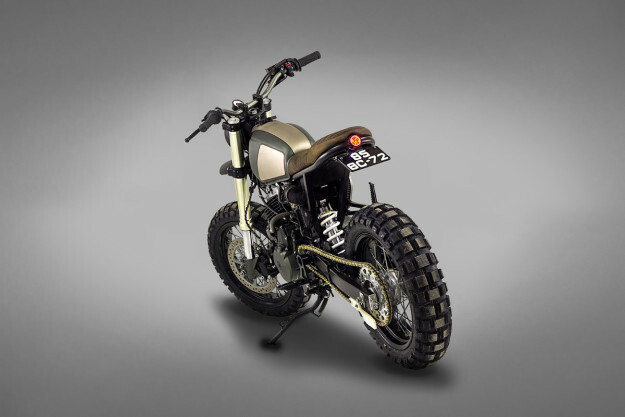 But rather than using the popular NX650 ‘Dominator’, they opted for a 2005 FMX650—a supermotard based on the same platform. 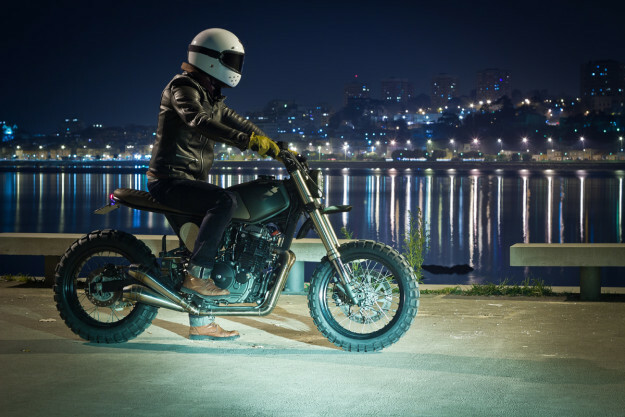 Ton-Up’s client lives in the former Portuguese colony of Angola, and needed something to tackle both city streets and backcountry dirt tracks. And he races enduro and supermotard, so the tall FMX was the perfect candidate. Ton-Up completely reworked the subframe, capping it off with an integrated tail light and license plate holder. The wiring’s been simplified, and is tucked away in a neat box under the custom-made seat. 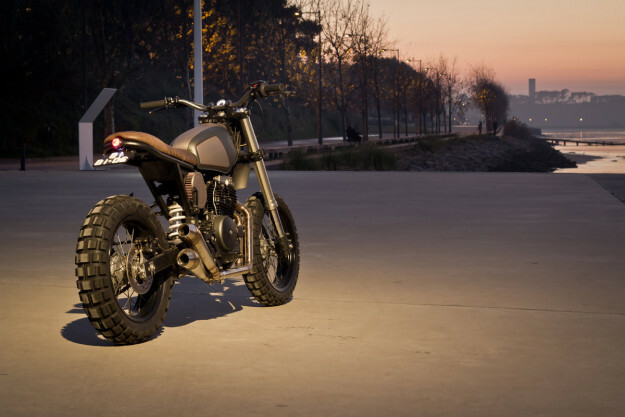 A fuel tank was picked out from a stash of old Honda tanks, and adapted to fit the FMX’s frame. 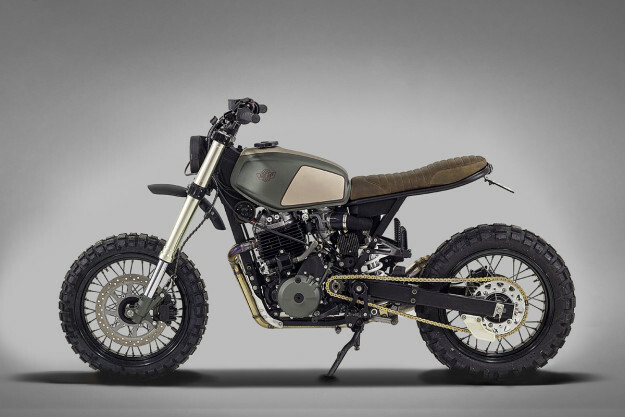 The guys lowered the bike’s upside-down forks slightly to tweak the its stance, and wrapped the stock 17″ wheels in Continental TKC80s (an appropriate tire choice, given the bike’s intended use). There’s also a new air filter setup that’s particularly intriguing, and should be robust enough for the Angolan sand. It consists of an oval K&N filter, mounted to the side of the bike and hooked up with a purpose-built intake. The twin exhaust system is bespoke too. Ton-Up also made a new front mudguard, and rear passenger peg mounts. 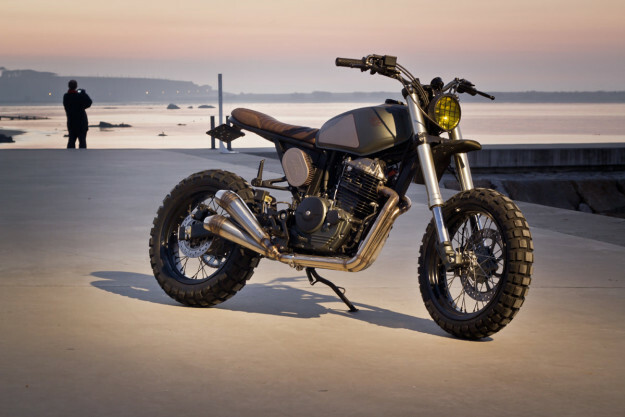 The bike’s further equipped with Renthal bars, Biltwell Inc. grips, a Motogadget speedo and a new headlight with a protective grill. As we’ve come to expect from Ton-Up, the final colour scheme is sublime. 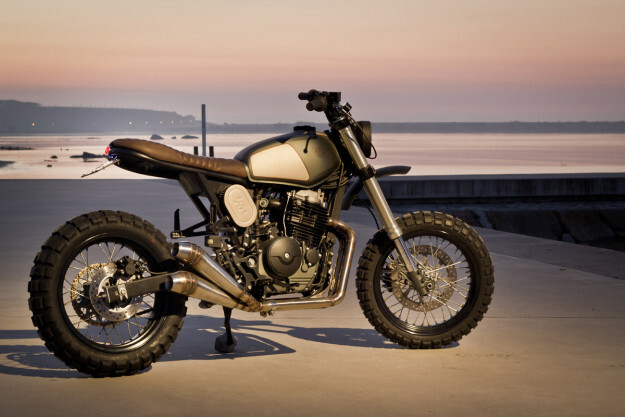 It’s dominated by earthy tones, right down to the last detail; look closely, and you’ll see the tank’s olive tone repeated on parts of the engine. And even the air filter cover’s been repainted. If we had to pigeon-hole ‘Muxima’, we’d file it under ‘retro supermotard’. Regardless of what you call it though, it looks like bags of fun to us.